Oil refineries are industrial facilities that convert crude oil into different useable products. Refining is referred to as a “downstream” component of oil production and processing. While the general process of refining is standard, it is adapted at individual refineries based on the properties of the crude oil extracted from the earth and on the desired outputs (refined products) Colwell, R. F., P.E. (2009) Oil Refinery Processes: A Brief Overview. Process Engineering Associates, LLC. Retrieved from http://www.processengr.com/ppt_presentations/oil_refinery_processes.pdf Colwell, R. F., P.E. (2009) Oil Refinery Processes: A Brief Overview. Process Engineering Associates, LLC. Retrieved from http://www.processengr.com/ppt_presentations/oil_refinery_processes.pdf Colwell, R. F., P.E. (2009) Oil Refinery Processes: A Brief Overview. Process Engineering Associates, LLC. Retrieved from http://www.processengr.com/ppt_presentations/oil_refinery_processes.pdf Colwell, R. F., P.E. (2009) Oil Refinery Processes: A Brief Overview. Process Engineering Associates, LLC. Retrieved from http://www.processengr.com/ppt_presentations/oil_refinery_processes.pdf Colwell, R. F., P.E. (2009) Oil Refinery Processes: A Brief Overview. Process Engineering Associates, LLC. Retrieved from http://www.processengr.com/ppt_presentations/oil_refinery_processes.pdf  Kraus, Richard S., (2011) Petroleum Refining Process. Oil and Natural Gas, Encyclopedia of Health and Safety. Retrieved from http://www.ilo.org/iloenc/part-xii/oil-and-natural-gas/item/384-petroleum-refining-process Kraus, Richard S., (2011) Petroleum Refining Process. Oil and Natural Gas, Encyclopedia of Health and Safety. Retrieved from http://www.ilo.org/iloenc/part-xii/oil-and-natural-gas/item/384-petroleum-refining-process Kraus, Richard S., (2011) Petroleum Refining Process. Oil and Natural Gas, Encyclopedia of Health and Safety. Retrieved from http://www.ilo.org/iloenc/part-xii/oil-and-natural-gas/item/384-petroleum-refining-process Kraus, Richard S., (2011) Petroleum Refining Process. Oil and Natural Gas, Encyclopedia of Health and Safety. Retrieved from http://www.ilo.org/iloenc/part-xii/oil-and-natural-gas/item/384-petroleum-refining-process Kraus, Richard S., (2011) Petroleum Refining Process. Oil and Natural Gas, Encyclopedia of Health and Safety. Retrieved from http://www.ilo.org/iloenc/part-xii/oil-and-natural-gas/item/384-petroleum-refining-process . Petroleum refining is a very complex system, but it can be generalized into five main areas. Separation: The first part of the process where the crude oil is physically separated by fractionation using atmospheric or vacuum distillation towers. Fractionation takes advantage of the various boiling point ranges of different groups of hydrocarbon molecules of the crude oil to separate the products in gas form. Conversion: The second general process which changes the size and structure of hydrocarbon molecules through a number of processes. Hydro, thermal, and catalytic cracking, or coking, are used to divide and decompose these hydrocarbon molecules. Unification and alteration processes combine and rearrange the molecule arrangements. These manipulations of the hydrocarbon molecules create the various grades of crude oil, which must be treated. Treatment: Involves the removal of non-hydrocarbons, impurities, and other constituents that affect the performance of the product or reduce efficiency of the refining process. Other: Many other operations and facilities exist within the plant that indirectly affect the refinery process including all water treatment processes, cooling, hydrogen production, and more. 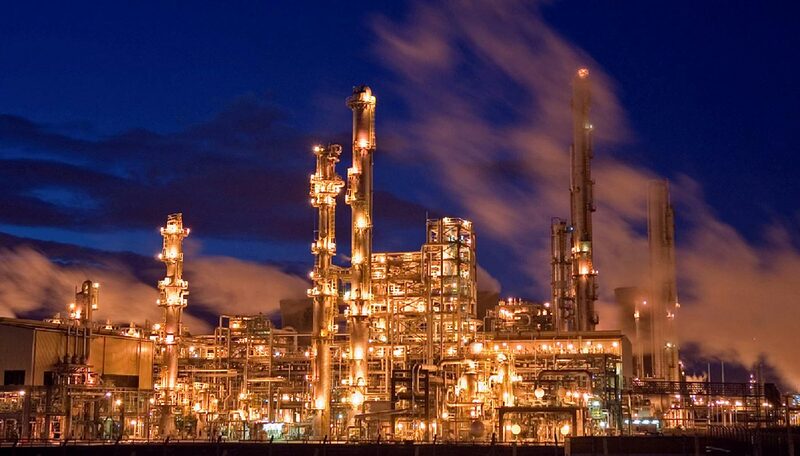 There are also non-process related facilities including power generation, product movement, tank storage, flares, alarms and sensors, control rooms, and many others that make refineries an efficient and safe environment. Petroleum products, refined from crude oil, span many facets of human consumption including fuel for various modes of transportation, synthetic fertilizers, rubber products, printing inks, textiles, cosmetics, paints, alcohols, many industrial processes, and countless others. Each of these products requires a different type, or “grade”, of crude oil which are only attainable through the refining process. For this reason, refineries are integral to the oil supply chain Petroleum Refining Processes. OSHA Technical Manual Section IV. Chapter 2, United States Department of Labor. Retrieved from https://www.osha.gov/dts/osta/otm/otm_iv/otm_iv_2.html Petroleum Refining Processes. OSHA Technical Manual Section IV. Chapter 2, United States Department of Labor. Retrieved from https://www.osha.gov/dts/osta/otm/otm_iv/otm_iv_2.html Petroleum Refining Processes. OSHA Technical Manual Section IV. Chapter 2, United States Department of Labor. Retrieved from https://www.osha.gov/dts/osta/otm/otm_iv/otm_iv_2.html Petroleum Refining Processes. OSHA Technical Manual Section IV. Chapter 2, United States Department of Labor. Retrieved from https://www.osha.gov/dts/osta/otm/otm_iv/otm_iv_2.html Petroleum Refining Processes. OSHA Technical Manual Section IV. Chapter 2, United States Department of Labor. Retrieved from https://www.osha.gov/dts/osta/otm/otm_iv/otm_iv_2.html . There are tight regulatory compliance requirements for oil refineries and their environmental impact. Air emissions from the refining process include hydrogen sulphide, sulphur dioxide, nitrogen oxides, and carbon monoxide. The wastewater created contains hydrocarbons, dissolved materials, suspended solids, phenols, ammonia, sulphides, acids, alkalis, and other contaminants. A number of controls are utilized to reduce or eliminate these contaminants through preventative and reactive measures. Due to high temperatures, high pressures, and various chemicals utilized throughout the process oil, oil refineries have developed very comprehensive medical, personal protection, and product safety programs. Sorry, we do not yet have a video specifically for Refining. We are adding new videos to StudentEnergy.org weekly, but in the meantime check out this video on Oil.